When it comes to selling hotels and resorts, one the most formidable challenges facing today’s agents is determining what type of vacation experiences will match a client’s very particular set of requirements. Each segment of the hotel industry, of course, offers travelers a specific set of benefits. For some travelers, an all-inclusive resort provides the best option. For others, the best choice is a luxury property. For others still, a stay at a boutique hotel provides the best vacation. The one thing that the all-inclusive, luxury and boutique segments have in common is this: They all offer agents the potential to significantly boost their sales and profits. Following are selling points on these three segments. 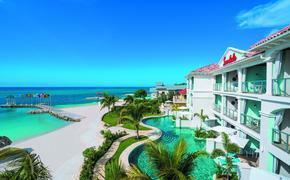 Put another way, when it comes to all-inclusive resorts, typically what you see is what you get. “A cruise might offer a low upfront price for the client, but once all the extras are added — drinks, shore excursions, gratuities, optional dining venues — an all-inclusive vacation becomes a much better value,” says Beth Baran, owner of Travel Leaders locations in Mason, Ohio, and Fort Thomas, Ky.
“People are tired of getting nickeled and dimed, and with an all-inclusive you don’t have to worry about that,” she notes. Furthermore, the appeal of allinclusive resorts is wide-ranging, providing excellent options for families, honeymooners and destination weddings groups. Destination weddings, meanwhile, provide a win-win for both agents and their clients, offering a great value for the bride and groom and attractive commissions for travel counselors. All things considered, booking destination weddings is often a fairly straightforward process, since many resorts employ wedding planners who handle details of destination weddings. Friedman says he reads as many as 30 travel publications to stay abreast not only of the luxury segment but also the travel industry as a whole. Schoeder speaks from personal experience. “I paid through the nose,” she says, adding that it was worth the expense to experience firsthand the features and amenities offered at luxury hotels. With product knowledge in hand, agents can then develop strategies to boost their luxury hotel sales and revenue. One sure-fire way to spark the interest of prospective luxury clients is to provide value-added amenities to heighten the vacation experience. Invariably, consortiapreferred suppliers provide value-added amenities such as early check-in and late check-out, complimentary bottles of wine and room upgrades. In addition to capitalizing on consortia perks, agents should also consider contacting general managers directly to obtain client perks. “It’s just a way to show a client appreciation, but it also shows that you have a relationship with the hotel and that, from the client perspective, means a lot — that you’re not just calling central reservations,” says Friedman. Knowing how to upsell clients from mid-priced hotels to luxury properties can also help travel agents tap into the highend hotel market. “If clients are booking the biggest room at a Marriott why not offer them the least expensive room at a Ritz-Carlton?” asks Schoeder, adding that in many cases the rates might be comparable. “Even in the basic room at the RitzCarlton, you’re paying for better service,” she says. Joanne M. Wilson, owner of VIP Travel in Jackson, Miss., has found success in offering clients a lower rate when she knows they are financially crunched. “I start off with the introductory price as ‘X’ amount of dollars, but say that’s for a garden view and you realize for just an incremental amount more you can be upgraded to a junior suite,” she says. Then she details what the extra dollars will buy. “Not only will you get a sitting area but you may also get an oceanview room with extra amenities,” she tells clients. For the most part, customers who are attracted to boutique hotels tend to be more sophisticated travelers interested in experiential vacations. Generally, boutique hotel clients are also looking for personalized travel experiences. “A good match would be a laidback client who is interested in intimacy and little personal touches, those who want charm,” says Friedman. Often, travelers who would be attracted to boutique hotels aren’t terribly interested in all the bells and whistles that larger chain hotels provide. “They just want a charming, relaxing place that doesn’t have the feel of a commercial property with large lobby bars,” he says. A version of this article appears in print in the August 2015 issue of Vacation Agent Magazine.